Editor’s note: The development of heparin induced thrombocytopenia (HIT) can be a devastating and even fatal condtion when associated with thrombosis. Several decades ago I was taught that patients who develop HIT should never be exposed to heparin again… not even heparin coated catheters. Then several years ago, that concept got turned upside down when world class leaders reported that HIT antibodies typically disappeared within a few months after HIT and that heparin could be administered safely at that time. Some of the same world class leaders are now saying that the use of heparin in antibody-negative patients may NOT be so safe after all. Patients undergoing cardiac or vascular surgery are at an especially high risk of HIT. In 17 such patients in the study described below, 11 developed HIT antibodies, 8 developed the more definitive SRA seroconversion, and 1 developed clinical HIT. The following summary is provided by Dr. Lydia Chen (a Pharm.D. resident at the University of California – Davis Medical Center) who was kind enough to bring these new data to my attention. Please note that this and other blog postings are cataloged into the searchable data base at http://www.ClotCare.org. 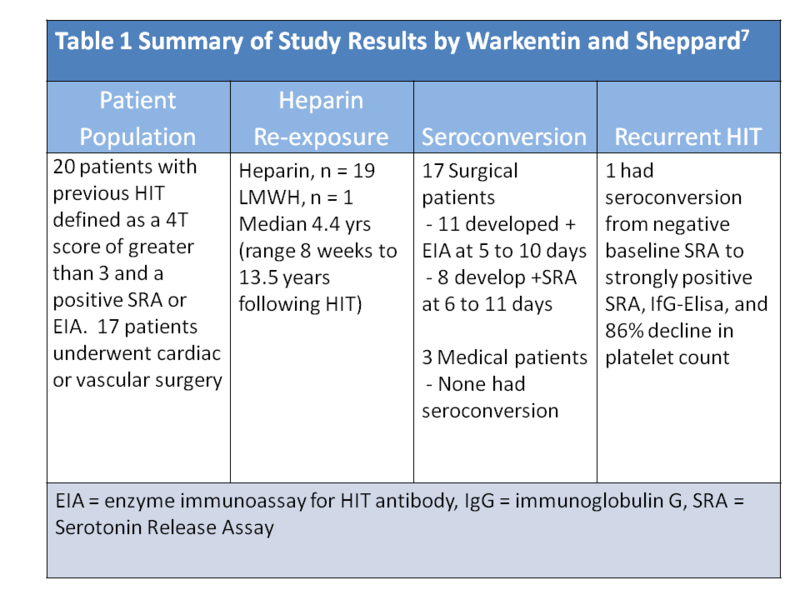 Warkentin and Sheppard recently published a study on the serologic profile of patients with a history of HIT and heparin re-exposure. The authors found that 11 of 17 patients with a history of HIT who received intra-operative heparin for cardiac or vascular surgery developed recurrent anti-PF4/heparin antibodies.7 One patient developed recurrent clinical HIT with a delayed decline in platelets one week after surgery despite receiving no heparin products post-operatively.7 Data from the study are summarized in the table below. In summary, it is unclear whether re-exposure to heparin in patients with a history of HIT is a safe practice. Current literature provides some direction in the types of patients that are less likely to develop recurrent HIT but new data continues to shed light on this controversy. Spinler AS and Dager WE. Overview of heparin-induced thrombocytopenia. Am J Health-Syst Pharm (2003);60:S5-S11. Warkentin TE and Sheppard JI. Serological investigation of patients with a previous history of heparin-induced thrombocytopenia who are reexposed to heparin. Blood (2014);123:2485-93. By Henry I. Bussey, Pharm.D. in Heparin on January 9, 2015 .